Creating a good grid is often tough, even if you use Pointwise. Unfortunately, you often have to re-create the grid: whether to explore design changes, to optimise your design, or for other reasons beyond your control. Sculptor addresses this need: it eliminates both re-CAD and re-Mesh. Optimisation is an attractive idea: ask the software to vary the parameters in your model to identify cause-and-effect relationships. CAD models, though, are most often created for manufacture or assembly. The parameters embedded in these models are harder to relate to pure functional-behavior. Designers have long known that subtle changes in shape can lead to significant changes in performance. Sculptor gives you this freedom: easily create design variables from the shape of your model, and use either Sculptor's own Optimisation Control Center or interface with external tools such as Dakota or modeFrontier to explore your product's functional behavior. 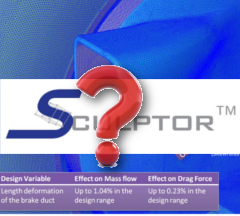 To learn what Sculptor's ASD Volumes can do for your specific needs, drop us a line: we sell and lease the software in India, provide support, provide training, and are willing to look at anything else you need to get your grid-modification and shape-optimisation humming. Go to the Sculptor website for examples, together with detailed videos explaining how they were made. Applications addressed include Aerospace, Automotive, Turbomachinery, and more.